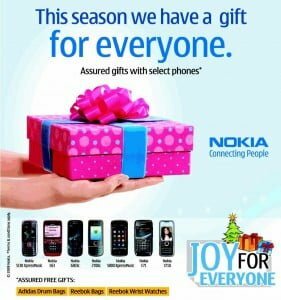 In a bid to promote its particular handset range, Nokia, the world’s largest phone manufacturer has decked up an Assured Gift offer for Indian market in this festive season. 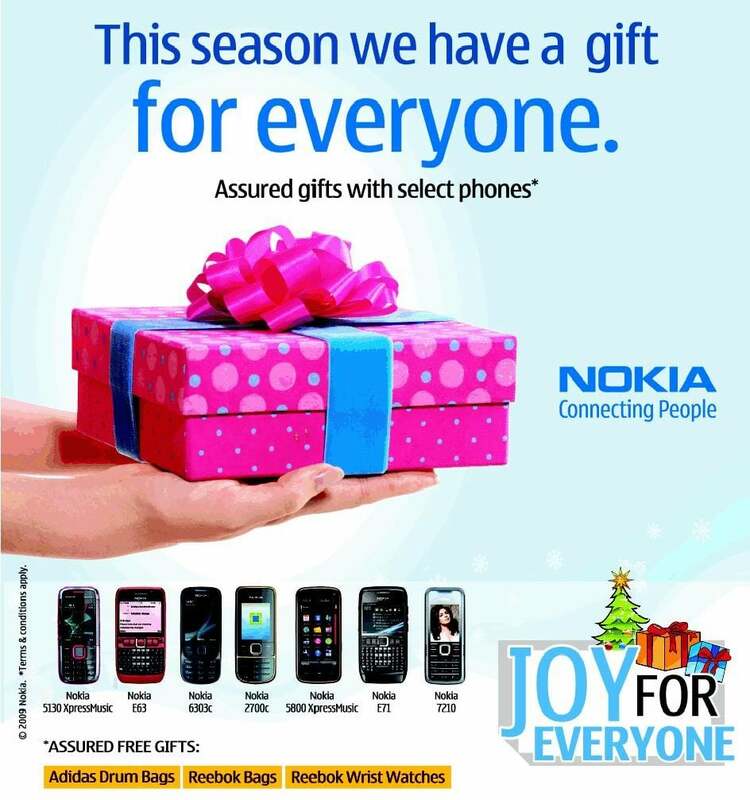 Nokia initiated Handset Marketing Program daubed as ‘Joy for Every One’ which offers Free Adidas Drum Bag, Reebok Bags and Reebok Wrist Watches as assured gifts on purchase of any mobile phone from the selected range of Nokia GSM Mobile Phones at Nokia Stores. The Assured Gifts will be available on purchase of Nokia 5130 XpressMusic, Nokia E63, Nokia 6303C, Nokia 5800 XpressMusic, Nokia E71, and Nokia 7210 Super Nova. For more information on offers and Nokia Stores call 30303838 at Local call charges from private operator’s (Vodafone/Relinace/Airtel/Idea/Aircel/Tata) phone Or on 1800-425-3388 Toll free from BSNL/MTNL phones. But the NICE GIFT, most of us are expecting from NOKIA is the launch of DualSIM mobiles as early as possible.. (Confirmed launch of 1 or 2 mid/lower end handsets around second half of 2010, by MR’s Eldar in twitter.. I respect and partially agree with the comments above, however, if you see, all phone models are not so old… E63 and E71 are still liked by many….. I wish Nokia announce some good exchange offers so that people can go for more options, which will ultimately generate more revenues for NOKIA too….